This weekend Harrison and I made the trip up to Durham from Wilmington this weekend to visit his family. Conveniently, there is an REI in Durham, meaning we could go and get some of the things we wanted to pick out in person, happy early birthday to me! The most important piece of gear. The shoes don’t do the walking, but they sure make it easier or harder on you on the way to Katahdin. We both tried on several types and brands. We spent the bulk of our time here weighing pros and cons of different types of boots with Nancy (shoutout to her for being awesome – go to the Durham REI and get fitted by her if you want a great experience). Even though we both had an idea of what we wanted, we were still so overwhelmed by the amount of options there were displayed on that wall! So many to pick from! 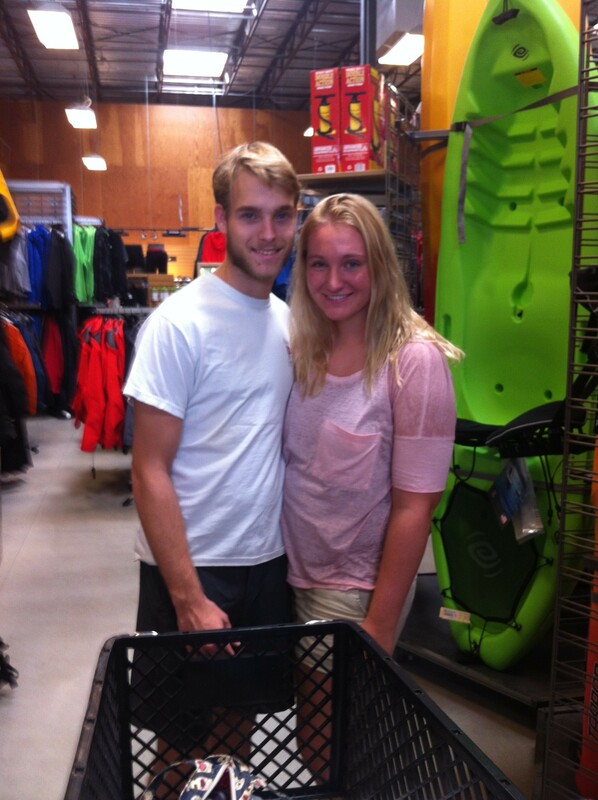 She spent almost two hours with us helping us to find the shoes that were right for us. Being so important, this is the one place where Harrison and I were willing to completely splurge, so we wanted to take the time to find the perfect fit! Harrison has flat feet, knee problems, and has broken his ankle, so he wanted the extra support and decided to go with boots, a decision that he ended up sticking with while picking out his. 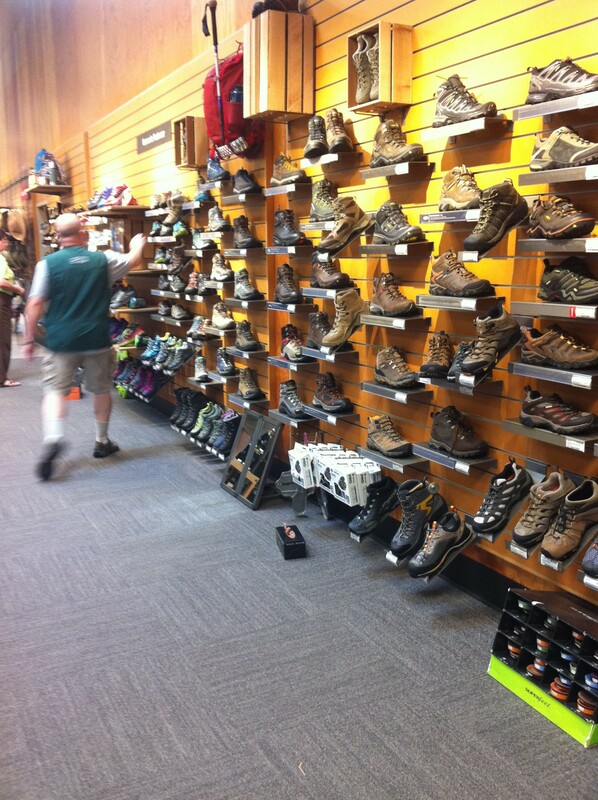 He liked the sturdier feel of the boots compared to trail runners or low cut boots. Before coming in, I had thought that I would go with a low cut boot model, as I have never really liked feeling constricted in the ankle area, and I did not think the weight was worth it. However, I ended up going with a higher cut model as well. After trying on some lower cuts I decided that the extra support would be worth it. 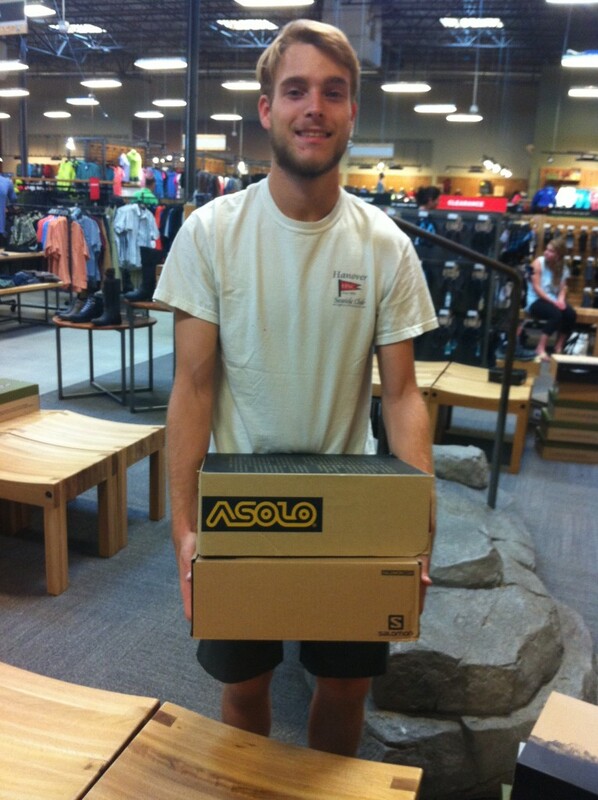 After trying on pair after pair, Harrison picked the Asolo Fugitive Gortex HIking Boots and I chose the Salomon Quest 4D II Gortex Hiking Boots. We both liked how supportive they were, while still being lightweight and non-restricting. 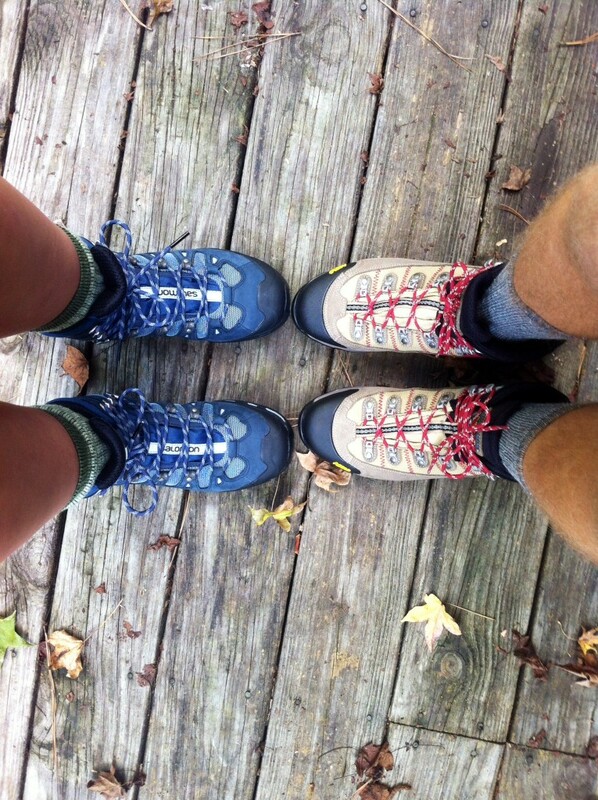 After wearing them around the house for a day, we took them out on the trails for a short 3-mile hike with Harrison’s Dad and they felt amazing. We tested their water resistance by splashing around in a stream with Harrison’s dog and we both stayed completely dry. We are both really happy with these so far! 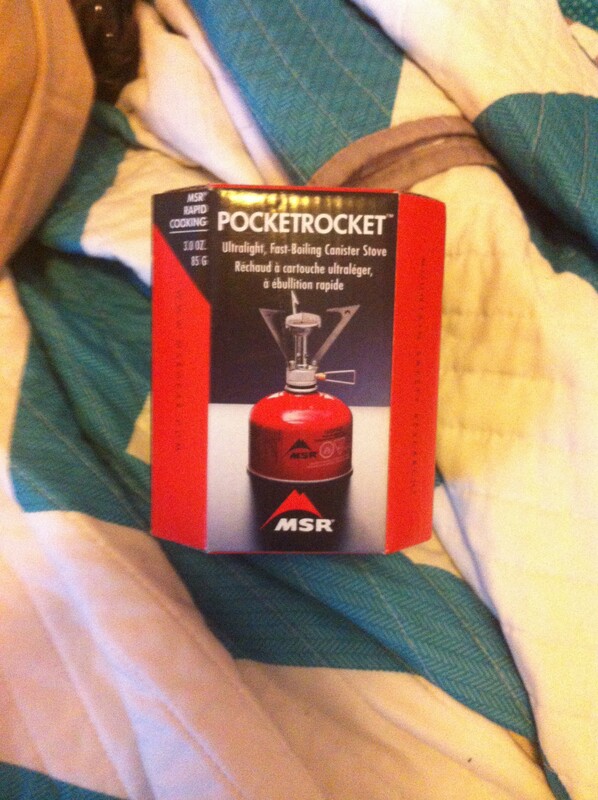 After tons of online research, talking to the REI employees, and getting to see all of the different models of stoves, we ended up going with the MSR PocketRocket. It crazy small, about 4 inches long and 2 inches wide when it is in its case, and weighs in at only 3 ounces. It was sturdy enough to support the pot that we have, and takes a fuel that is easy to access along the AT. 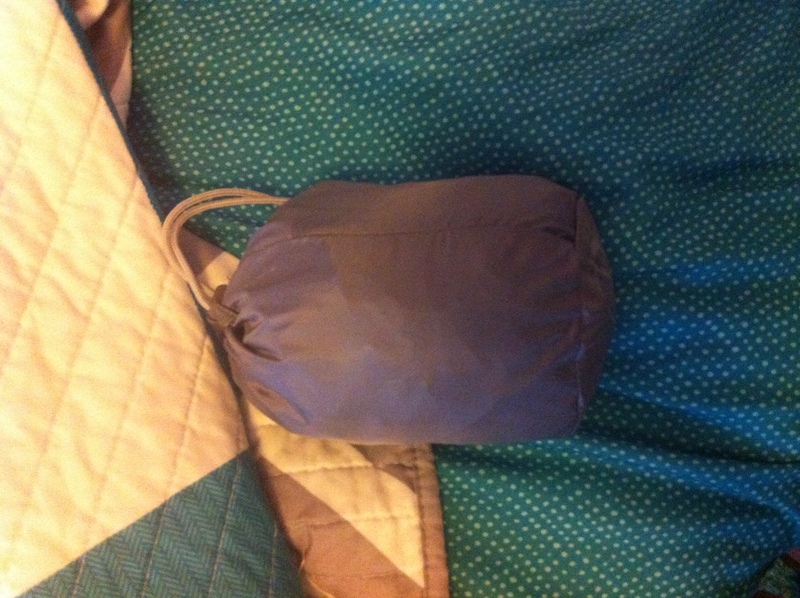 I picked up a REI Duck’s Back Rain Cover to protect my Osprey Aura 65 AG backpack (I’ll post about the pack later). I held it under a shower head for a few minutes and it had zero leakage. 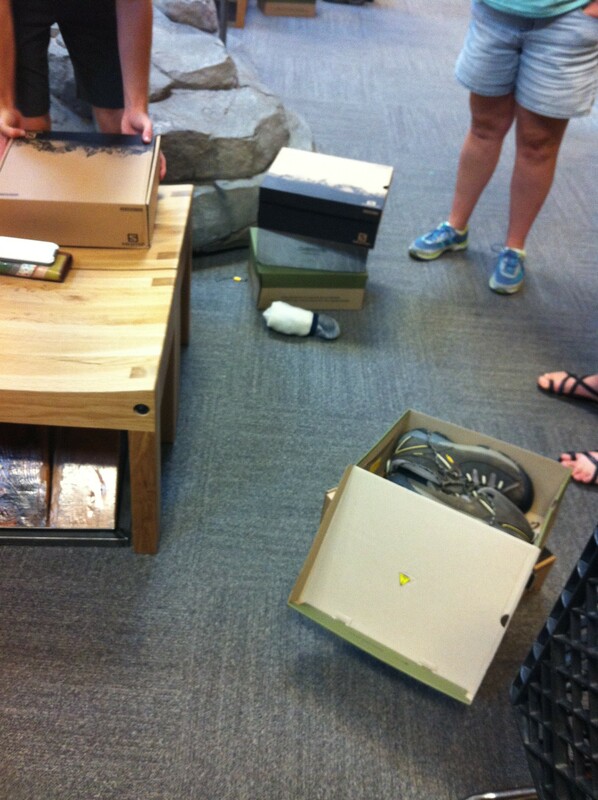 Thanks for the quality REI! We finished off our traveling kitchen by purchasing a 1.6L pot, a super small and absorbent mini towel, two mugs/bowls, and one cutting board/plate. Harrison had the idea of instead of going without plates, sharing one, or having to carry the weight of two, that we simply get a lightweight cutting board that can serve as a plate for both of us, and a way to keep food off of the ground or whatever surface we are cooking on. 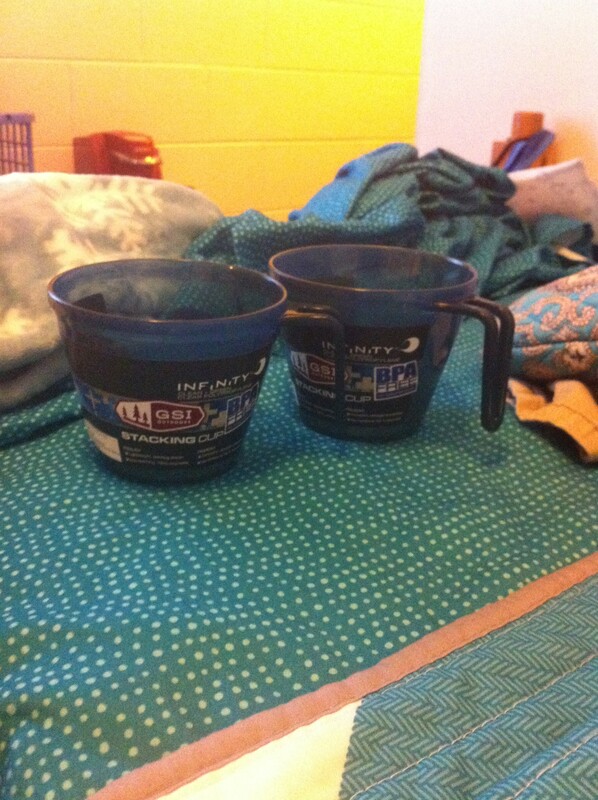 We debated on whether to go with the 1 Liter model or the 1.6 Liter model. We ended up going with the 1.6 since we will be doing most of our cooking together, and we want to ensure we have enough space. We may downsize, but we will decide that after our shakedown hike. These cups are virtually weightless and are big enough to serve as a bowl or a mug when needed. Using a lightweight cutting board gives us an area to prepare food that is off of the ground and also gives us enough space to both use it as a plate if we want to. We also got a dry bag for food, a compression dry sack for our sleeping bag, socks, insoles for harrison, and a smattering of other small things. 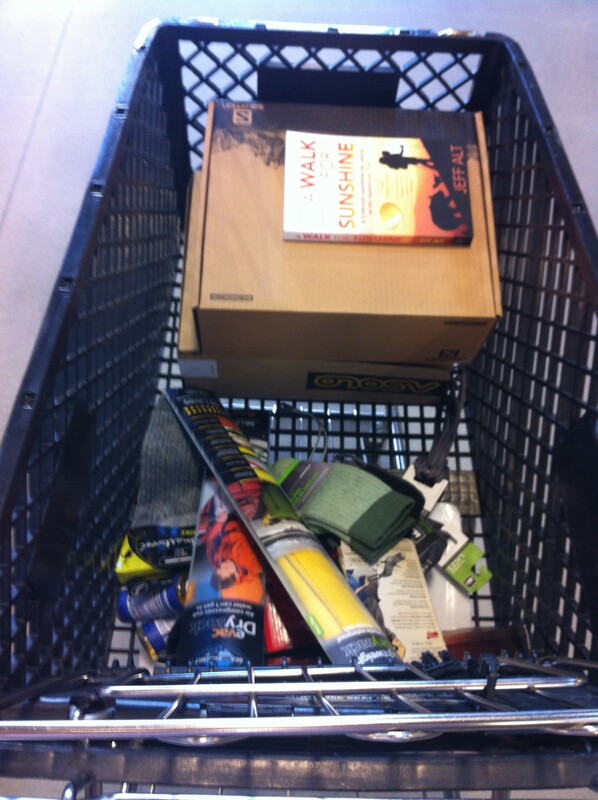 We have now bought all of the major pieces of gear we need! Let’s hope they all make it through our shakedown hikes and live to see the AT! Full Gear list to come shortly! Alex is currently studying Environmental Science at the University of North Carolina Wilmington. As soon as she graduates this May she will be trading the beach for the mountains and embarking on a thru-hike of the Appalachian Trail! 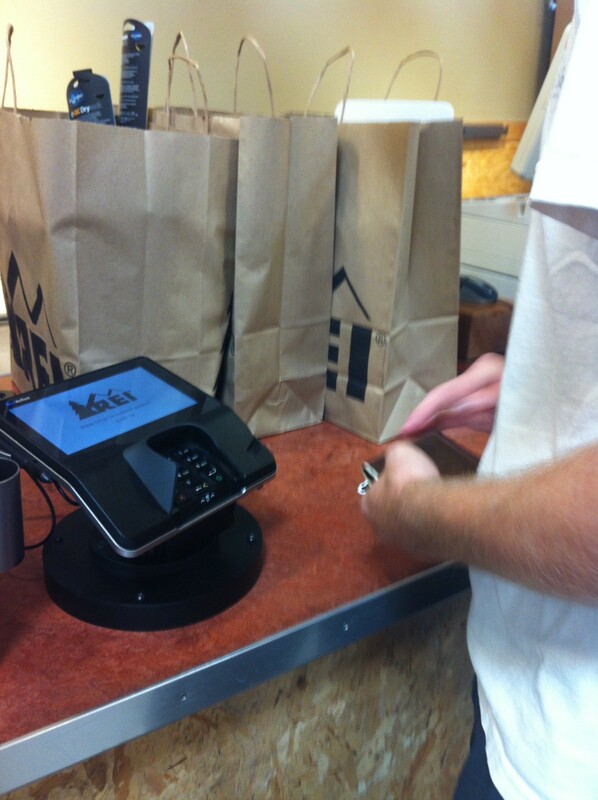 Congrats on your new acquisitions. But I am sure that you anticipated when you put your equipment purchases out there that you would be getting some alternative opinions. I hope you don’t mind if I offer a few. Boot fit and style are certainly an individual choice. But I think you choosing the GoreTex lined boots is a mistake. The boots will most certainly get wet inside – rain, deeper ford than you anticipated, most of all SWEAT – and the GoreTex sock liner just keeps the boots from drying out. Where lighter weight shoes/boots might dry in an afternoon, your waterproof/breathable (a misnomer if there ever was one) will literally take days to dry; by which time they will be wet again. In other words, they will seldom be dry. 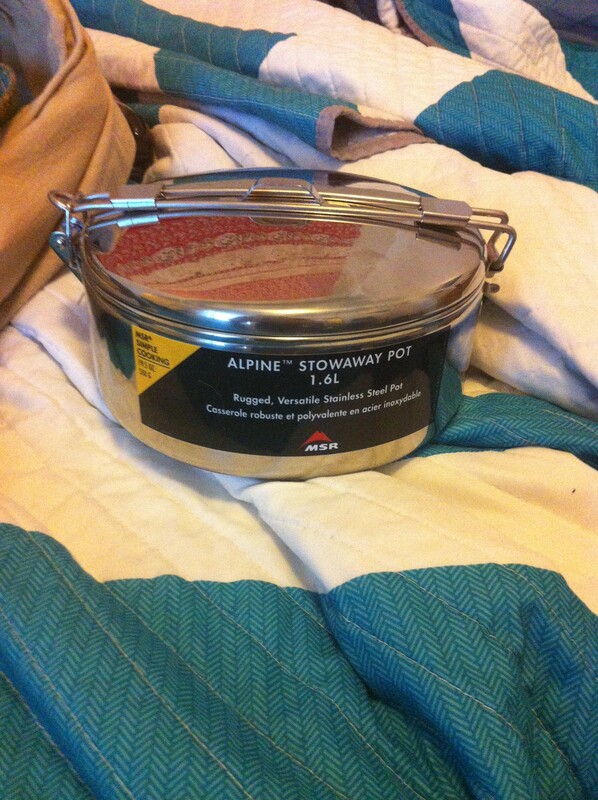 The stainless steel MSR pot weighs 19.5 ounces. I agree that the size is a good choice for two, the weight is simply too much. An Evernew 1.9liter, non-stick Titanium pot weighs 8.8 ounces, less than half the weight. It, or another Ti pot would be a much more reasonable choice. The cutting board weighs almost 6 ounces, way too heavy. 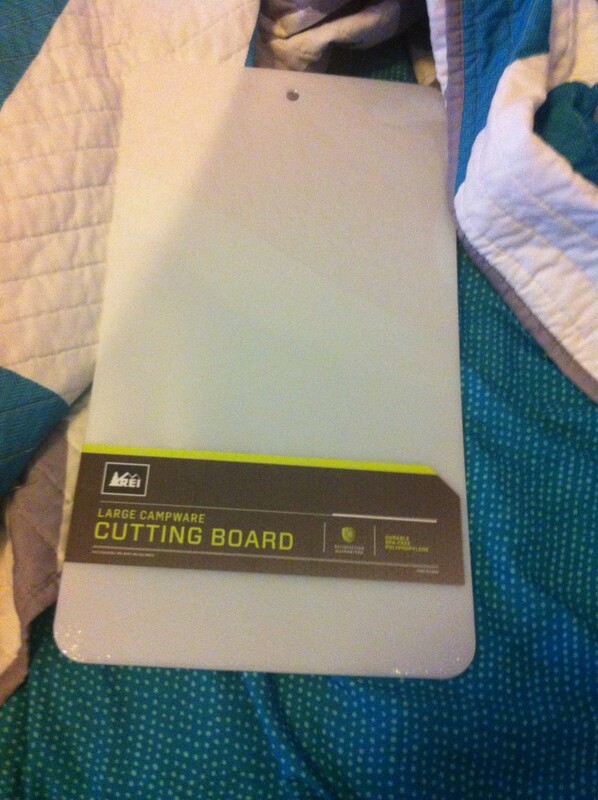 You can buy a very lightweight flexible cutting board at Walmart that weighs less than 1/2 ounce. The ounces add up to pounds very quickly. You need to start qualifying every equipment purchase by thinking in terms of grams or ounces – tempering an items obvious utility by the knowledge that you will have to carry it every day, whether or not you use it every day.